Sometimes life at home can get a bit dull but we can’t always escape on holiday. Luckily, there are plenty of slots at Winner Casino that will transport you through time and space on a variety of adventures. Best of all, the slots also give you the chance to win a huge amounts of money so you could soon be off on a real life adventure of your own. If you have read Miguel de Cervantes’ novel Don Quixote then you will know all about the character and his adventures, but even if you haven’t you can still have a fantastic time playing the slot based upon him and with a bit of luck share in his great riches. 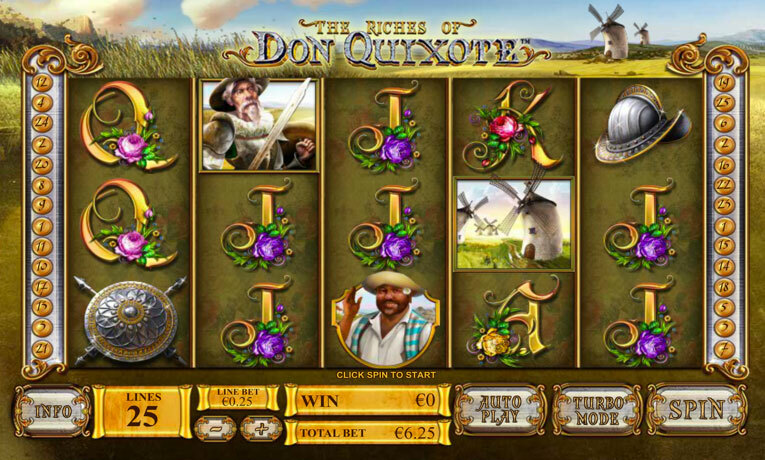 The Riches of Don Quixote is a 5 reel slot with 3 rows and 25 fixed paylines. Behind the reels you can see a typical seventeenth-century Spanish landscape complete with windmills and fields stretching to the horizon. There are five high value symbols Don Quixote, Sancho Panza, a girl, a helmet and a shield. The lower value symbols are the playing cards J through to A decorated with flowers. All of the symbols, except Don Quixote and Sancho Panza, land in stacks two high on the reels. The windmill is the wild symbol, it can substitute for all the other symbols, except the scatter symbol, to help and form winning combinations. The scatter symbol is a copy of the novel. If you land three or more of the Don Quixote novel scatter symbols anywhere on the reels you trigger the La Mancha Free Spins. You are awarded ten free spins during which a windmill wild symbol is locked in the centre of the third reel. Furthermore, the free spins begin with a 1x multiplier but it increases by 1x every two spins so the final two spins come with a huge 5x multiplier. The Riches of Don Quixote has a betting range of £0.25 up to £25 per spin so it is perfect for all sizes of budget. The wild windmill offers a huge top payout of 3,000x. Don Quixote can payout up to 1,000x, Sancho Panza can payout up to 600x, the girl can payout up to 400x, the helmet can payout up to 200x and the shield can payout up to 150x. The scatter symbol also offers huge payouts of up to 100x your total bet when five land anywhere on the reels. 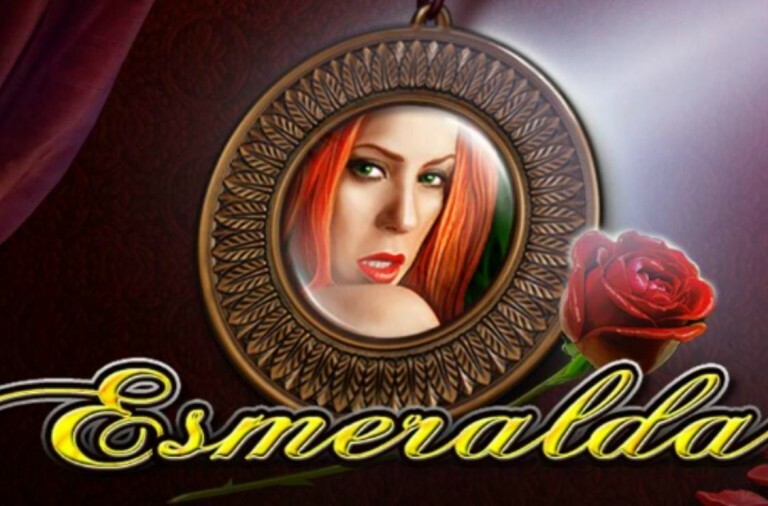 If you are looking for an exciting Spanish adventure then give this slot a spin today, with a bit of luck you’ll return home with piles of winnings. The Holy Roman Empire has been the inspiration for a number of games and this slot is a fantastic addition to the genre. It takes you back to a time when Romans were winning wars across the world and Rome was thriving as one of the richest cities on earth. While you play you can enjoy a number of special features and with a bit of luck win some massive payouts. 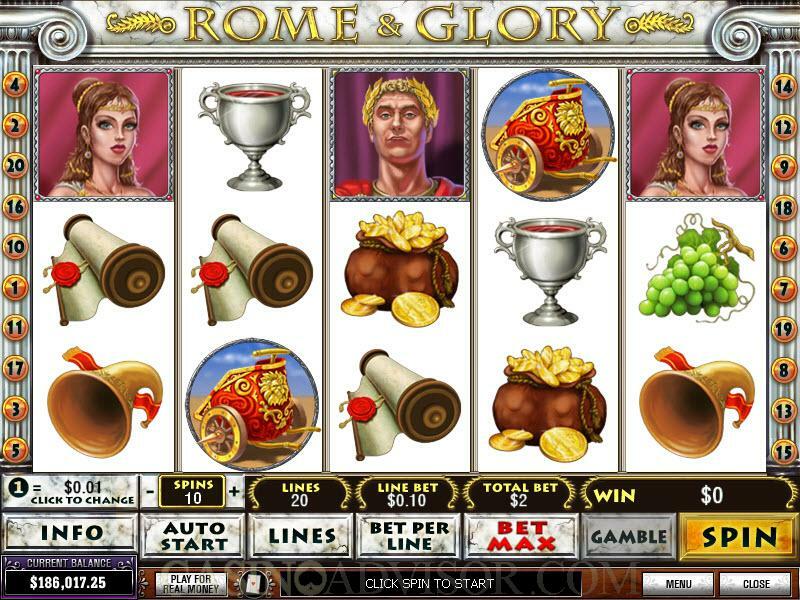 Rome & Glory is a 5 reel slot with 3 rows and 20 fixed paylines. The reels are set in-between two ornate columns with some polished marble visible above them. All of the slot’s symbols are related to the theme and include Caesar, his wife, the SPQR banner, a chariot, a trumpet, some grapes, a purse overflowing with gold coins, a goblet of wine and a scroll. In this game the scatter and the wild symbol are one and the same, a view of the Colosseum. It can land on all the reels and will substitute for all of the other symbols to help and form winning combinations. When three or more of the wild/scatter symbols land anywhere on the reels the free spins are triggered. During the free spins a random symbol is chosen to act as an extra scatter symbol. This means that you don’t need to land it along a payline to win payouts, as long as three or more land on the reels then you will win a payout multiplied by your total bet. 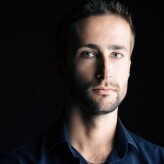 As a result, if one of the more valuable symbols are chosen it can lead to some huge payouts. Furthermore, more free spins can be won indefinitely by landing three or more wilds on the reels. Rome & Glory has a huge betting range of £0.01 up to £1,000 per spin so everyone can enjoy the game, regardless of their bankroll and budget. Caesar offers the slot’s top payout of 5,000x while his wife can payout up to 2,000x. The SPQR banner and the chariot can both payout up to 750x, the trumpet and the grapes can both payout up to 150x, while the purse, the wine and the scroll can all payout up to 100x. The scatter symbol also offers payouts of up to 200x your total bet when five land on the reels. It is also worth noting that Caesar, his wife, the banner and the chariot will payout when just two land along a payline. If you want a trip back in time to Ancient Rome to enjoy living like the Roman emperor then give this slot a try today. 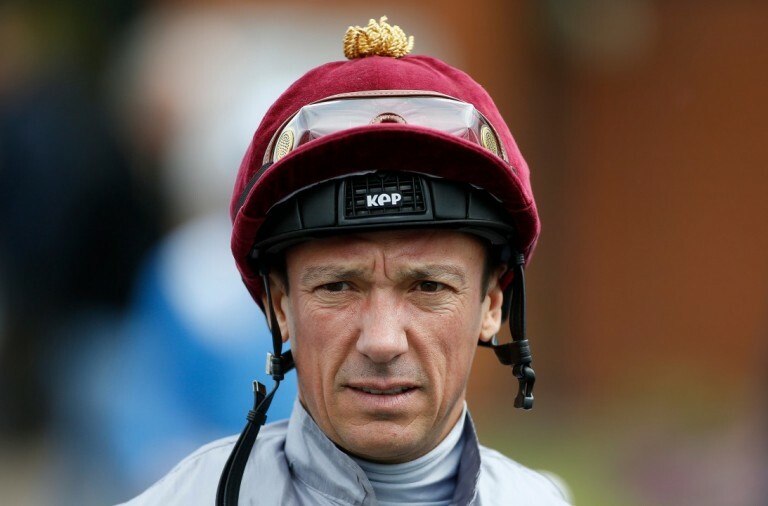 With a bit of luck you will land a huge number of wins and be revelling in your own glory. The Ming dynasty ruled over China for around three hundred years, from the middle of the fourteenth century until the middle of the seventeenth century, before the Qing dynasty took over. Now you can return to the days of the Ming Empire in this exciting slot that is offering you the chance to win a huge amount of money. 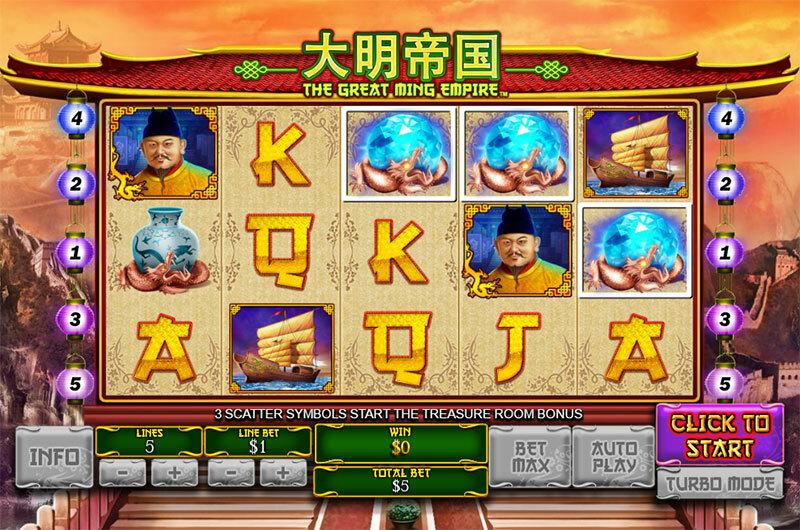 The Great Ming Empire is a 5 reel slot with 3 rows and up to 5 paylines. While this doesn’t sound like many paylines, they payout left to right and right to left so the number is effectively doubled. The reels are set on the side of a traditional Chinese temple with some mountains visible in the background along which runs the famous Great Wall of China. There are just three themed symbols, the Emperor, his consort and a Chinese junk floating on the sea. The remaining standard symbols are the playing cards J, Q, K and A. The wild symbol features the steps that lead up to the Emperor’s palace. However, it will substitute for just two regular symbols, the Emperor and his consort, in helping to form winning combinations. There are three scatter symbols, a case, a scroll and a large jewel. If you land three or more matching scatter symbols on consecutive reels then The Treasure Room Bonus begins. It is a picking game that takes place in a room with eight items of treasure displayed on pedestals. You need to pick three of them to reveal cash prizes that will be proportional to your bet. If you triggered the game with four scatter symbols then you win a 3x multiplier and if you triggered it with five scatter symbols then you win a 10x multiplier. The Great Ming Empire has a betting range of £0.01 up to £500 per spin so everyone can enjoy this oriental adventure game. The wild symbol offers a huge top payout of 2,000x when five land across the reels. The Emperor can payout up to 1,000x, his consort can payout up to 500x and the junk can payout up to 250x. The A, K, Q and J symbols can payout up to 200x, 150x, 100x and 50x respectively. 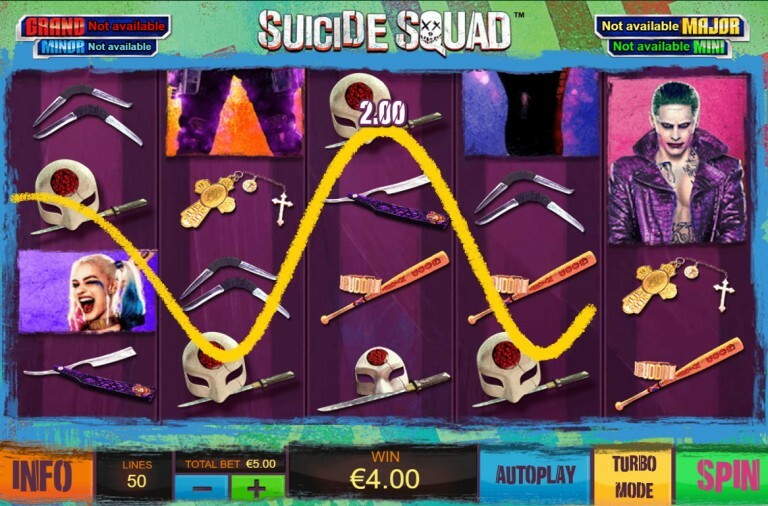 Furthermore, all of the symbols in this slot will payout when just two of them land along a payline. It is also worth reiterating that you can land winning combinations from left to right and right to left in this slot, making it far easier to win. If you like the idea of a trip to ancient China and the chance to win some enormous payouts then give this slot a spin today. With a bit of luck you will win your share of the Emperor’s riches and can plan a real trip to the orient of your very own. Each week we like to highlight a number of different featured games for players to explore. 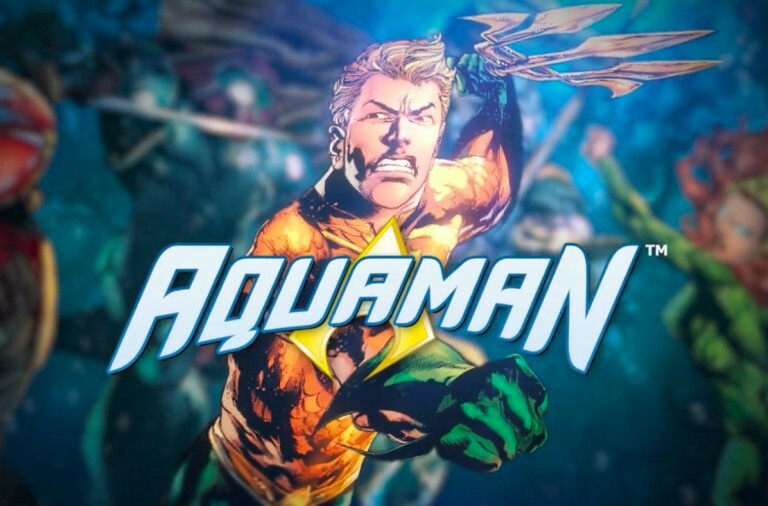 If none of this week’s appeal to you then don’t worry, next week there will be some more to look at and thanks to the vast variety of games at Winner Casino they are sure to be completely different. 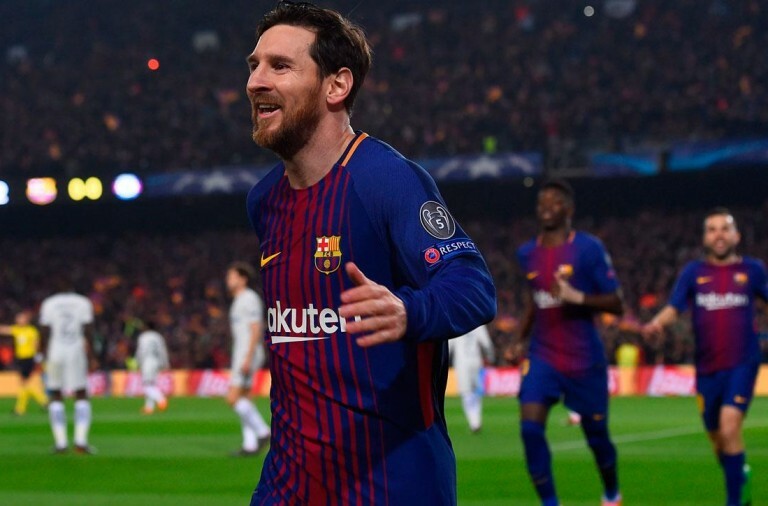 In the meantime, take a look around for yourself, there are plenty of games to discover and with a bit of luck this weekend will see you land masses of winnings.